With an opportunity to fully analyze national commercial sales and rental data from the second quarter of 2015, analysts have ranked the Atlanta Metropolitan Area high on the list of in-demand locations for office space. 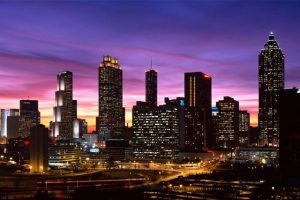 The large commercial real estate company DTZ revealed that Atlanta, Georgia actually ranked among the top 10 national markets in that field. DTZ began marketing real estate properties in Atlanta in 2014. The large firm, which presently employs over 43,000 and maintains an international client base, manages more than 4 billion square feet of office space around the world. The firm recently purchased Cassidy Turley and later merged with Cushman & Wakefield. Its research offers an authoritative source of information about commercial inventories in the Atlanta marketplace. DTZ compiled a list of the leading commercial office markets around the United States during the second quarter of 2015. It concluded that Atlanta enjoyed one of the strongest demands for office space nationally . In fact, the city ranked 5th on DTZ’s listing of the top markets in terms of demand for commercial office space for Q2 2015. At that time, with 993,000 square feet, the Atlanta market ranked just ahead of Phoenix with 850,000 square feet and just behind Los Angeles, with 1.2 million square feet. Analysts noted that during the second quarter of last year, the commercial real estate market in the United States experienced an increased demand from tenants for office rental space, a period of rebounding commercial leasing activity. This situation, in turn, fueled higher commercial rents in more than 70% of markets in the nation. Atlanta became one of the urban centers to benefit from these conditions. More recently, the solid demand figures from last year have evidently contributed to a resurgence in the commercial office rental market in the City of Atlanta. During the first quarter of 2016, commercial real estate professionals reported that some 3.4 million square feet of industrial real estate gained tenants, with the bulk of this activity occurring in the Northwestern and Southern parts of the Greater Atlanta Metropolitan Area. These figures would seem to bode well for office space in Atlanta, too, since increased manufacturing activity tends to support other, related business activities. Although office space rentals slowed during the first quarter with activity involving only 77,000 square feet, the promising industrial real estate transactions may herald an improvement in the future. Indeed, CBRE Group United States, a real estate investment firm, recently issued a press release revealing that as of April 21, 2016, the office vacancy rate in Atlanta stands at the lowest point during the past decade and a half, with only 17% of properties available. That figure should bring optimism to many commercial real estate firms. Will Atlanta Office Rental Rates Rise? The statistics about commercial office rentals during 2015 and early 2016 seem to beg the question: “Will commercial office rental rates in Atlanta rise this year?” Although no one can predict rental rates infallibly, some indications exist that increases may occur soon. Reportedly, office rates nationally increased during the second quarter of 2015 by 2.7% compared with the previous year’s second quarter rates. Analysts noted that rise represented the most robust increase since 2008. Office rental rates rose in 59 of the 80 unique national urban markets monitored by DTZ during Q2 of 2015. Coupled with the rise in new construction, this statistic might also give rise to optimism.